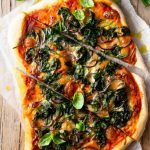 This Spinach Pizza is made with a light, fluffy but crispy pizza base, wilted spinach, red onion and plenty of Gorgonzola and mozzarella cheese. It's a fun and simple way to switch up pizza night and guaranteed to be a winner! Add the fresh spinach to a large pan with a the olive oil and wilt on a medium heat. Once wilted remove from the pan and set aside. then bake in the oven for 10 minutes or until the crust is golden and the cheese has melted. The toppings make enough for 1 large pizza that is enough for 2-3 people so you only need half a batch of the basic pizza dough. If you want to serve 4 simple make the full batch and double the toppings or choose different toppings for your second pizza. If using traditional pizza dough you'll need to prep it in advance and give it at least 4 hours to prove. Make sure to sprinkle the baking tray with a little semolina or flour before transferring the pizza crust. This will stop the crust from sticking and give it a crisper base. When wilting the spinach make sure not to cook it for too long is should be 'just wilted' or it'll become too soggy and wet. If you're not keen on gorgonzola cheese then taleggio would be a great alternative it's strong enough and melts perfectly. If using fresh mozzarella make sure to dry it with kitchen paper to get rid of extra moisture. Let the pizza sit for 2-3 minutes before cutting it.